Mammals sense or gather information about their environment and use it to make decisions that affect their survival and reproduction. Sometimes, species initially respond to one type of cue. For example, female hammer-headed bats (Hypsig-nathus monstrosus) in Africa locate groups of males by listening to their distinctive calls. Picking a male to mate with, however, is a decision females appear to make only after visiting several in the line of displaying suitors. A female's actual choice may involve more than just her response to the males' calls. 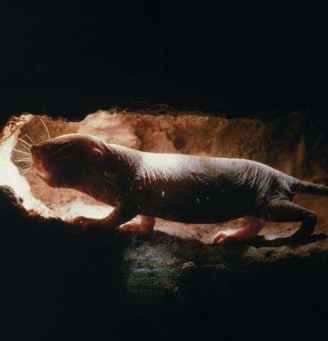 Mammals typically use clues collected from several modalities. For example, vervet monkeys must cope with different predators. Social animals, vervets have keen vision and extensive vocal repertoires that include several types of warning calls, which indicate the presence of a predator. Using different warning calls, vervets can alert group members to specific threats. One alarm call is given in response to snakes, another to mammals such as leopards (Panthera pardus), and yet another to raptors such as eagles. These predators pose different kinds of threats. Vervets typically see the predators, but use sound to alert their group mates to the danger. Because each type of predator requires different defensive behavior, the vervets have specific acoustic signals to increase the precision of their communication. their own young. This is a valuable behavior because milk is expensive to produce and vital to the survival of young. 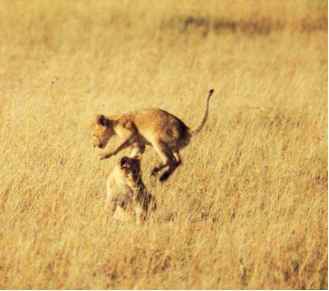 The level of challenge to the mother varies with different mammals. Ewes recognize their lambs by smell, and she usually finds her own lamb quite easily. The lamb imprints on its mother within in a few days of birth. A female Brazilian free-tailed bat (Tadarida brasiliensis) faces a more difficult challenge. She typically leaves her single young in a creche with hundreds or thousands of others. When she returns from foraging and looks for her young, she initially relies on spatial memory to locate the general area where her young might be, then she uses the calls of her young to pinpoint their location, and finally ensures that she is feeding the right young by smelling its scent. When females depend upon odor to recognize their offspring, the distinctive smell could be something produced by the young, something in the milk she has fed it, or her own distinctive aroma. In mammals, distinctive odors do more than mediate interactions between mothers and young. Young piglets (Sus scrofa) can recognize other piglets by the odor of their urine, which allows them to distinguish between familiar and strange individuals. In summer, Bechstein's bats (Myotis bechsteinii) live together in small groups (colonies). Individuals have specific odor signatures produced by a gland located between their ears. In other bats, such as big browns (Eptesicus fuscus), lesser-crested mastiff bats (Chaerephon pumila), or pipistrelles (Pipistrellus pip-istrellus), odors allow bats to identify their home groups or roosts. It is typical for individual aromas to reflect a combination of odor sources, not just the products of a single gland. Groups of mammals can also have distinctive vocalizations. Greater spear-nosed bats (Phyllostomus hastatus) use group-specific screech calls to locate other group members when they are feeding. In big brown bats and little brown bats (My-otis lucifugus), echolocation calls provide cues to group membership. Humpback whales (Megaptera novaeangliae) have distinctive songs that consist of phrases and arrangement of phrases in a music-like organization. Songs within a pod slowly change, so that last year's song is slightly different than the current year's song. Furthermore, phrases come and go in the overall repertoire. Songs also play a role in maintaining group cohesion. Male humpbacks sing from an inverted position and project their sounds over large ocean expanses. In the Antarctic, Weddell seals (Leptonychotes weddellii) have a large vocal repertoire of 34 underwater vocalizations, 10 of which are used only by males. Animals, including some mammals and birds, use echoes of sounds they produce to locate objects in their surroundings. This is echolocation behavior. Microchiropteran bats produce echolocation signals by vibrating their vocal cords— exactly the same operation humans use in speaking. Echolo-cating mammals hear echoes through their auditory systems, just as humans hear sounds. While echolocating bats collect echoes of their own sounds by their pinnae (external ears), odontocetes appear to collect sounds via their lower jaws. sequences of calls and their echoes. Some microchiropteran bats and toothed whales also use echolocation to obtain fine details about objects. Echolocating dolphins can distinguish between echoes from same-sized spheres of aluminum and glass (down to accuracy of 0.001 in [0.0025 cm]), while some echolocating bats detect insects smaller than midges and can distinguish flying moths from flying beetles. It is not obvious that other echolocating mammals (some species of shrews and tenrecs) collect and use such detailed information. Shrews and tenrecs appear to use echolocation while exploring, providing another medium for collecting general information about their surroundings rather than about specific targets. Most species of pteropodids, plant-visiting flying foxes of the Old World, do not echolocate. Furthermore, not all bats echolocate. Or, while Egyptian fruit bats (Rousettus aegyptiacus) and perhaps some other species in this genus (Rousettus) echolocate, they produce echolocation sounds by clicking their tongues. A further complication is that the role echolocation plays in the lives of some other bats is not known. Then, some phyllostomid, nectar-feeding bats, visit flowers that are specialized to deliver strong echoes of ultrasonic (echolocation) calls and thus guide the bats to the nectar they seek. While toothed whales living in turbid waters may use echolocation to find prey, it is not clear how often these animals use echolocation to find food in clear waters. It is not known if any of the mysticete (baleen) whales use echoloca-tion because none has been held in captivity to conduct the necessary perceptual studies. The echolocation signals of toothed whales, shrews, and tenrecs are short, click-like sounds composed of a range of frequencies (broadband). The echolocation signals of microchiropteran bats are tonal, because they show structured changes in frequency over time. The echolocation signals of toothed whales and some microchiropteran bats are very intense, measured at over 110 decibels; in the toothed whales, it is measured at over 200 decibels. Other microchiropteran bats and shrews and tenrecs produce signals of low-intensity (<60 decibels). Many species of echolocating bats that hunt flying insects and other species that take prey from the surface of water change the details of their calls according to the situation. Longer calls, often consisting of a narrow range of frequencies (narrowband) and dominated by lower frequency sounds, are produced when the bats are searching for prey. Once prey has been detected, the bats often produce shorter, broadband signals. Over an attack sequence, the calls get progressively shorter as does the time between them. The end sequence (or terminal feeding buzz) has closely spaced signals for precisely timed capture of the prey. Odontocetes can adjust the frequency and amplitude of their echolocation signals, depending on the amount of environmental noise. In areas of noise from snapping shrimp, dolphins produce louder and higher frequency signals to avoid the masking sounds of the shrimps' snaps. To ensure that they can hear faint returning echoes, echolocating mammals typically separate pulse and echo in time. In other words, most echolocating mammals cannot transmit signals and receive echoes at the same time because strong outgoing pulses deafen the echolocator to faint returning echoes, which means that collecting information about close objects requires signals that are short enough to be over before the echoes return. Differences in the density of water and air indicate that sound travels much faster in water, and cetacean echolocation signals are much shorter than those commonly used by bats. Some microchiropteran bats, including species of horseshoe bats (Rhinolophidae), Old World leaf-nosed bats (Hip-posideridae), and Parnell's moustached bat (Pteronotus parnellii; Mormoopidae), take a different approach to echolo-cation. They separate pulse and echo in frequency, meaning that they can transmit signals and receive echoes at the same time. 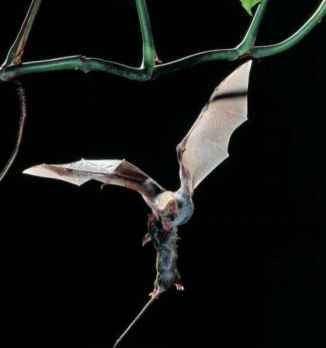 These bats depend upon Doppler shifts in the frequencies of their echolocation sounds to collect information about their surroundings and targets. Microchiropteran bats that separate pulses and echo in time produce short echolocation calls separated by long periods of silence. Separating pulse and echo in frequency produces much longer signals that are separated by shorter periods of silence. Some bats produce short signals that are called low-duty cycle, while others produce longer signals that are called high-duty cycle, reflecting the percentage of time that the signal is on (10% versus >50%, respectively). Anatomical evidence from Eocene fossil bats indicates that both high-duty cycle and low-duty cycle approaches to echolocation had evolved over 50 million years ago. The distance over which an animal can use echolocation to collect information will depend upon the strength of the original signal and the sensitivity of the echolocator's auditory system. As a signal moves away from the source (an echolocator's mouth), it loses energy through spreading loss and, for higher frequency signals in air, by attenuation. The same rules apply to the echo returning from the target. For a big brown bat, this means that the effective range for detecting a spherical target 0.7 in (19 mm) in diameter is 16.4 ft (5 m). This assumes that the initial signal was 110 decibels and that the bat's hearing threshold is 0 decibels. For 0.7-in (19-mm) diameter spheres located 32.8 ft (10 m) in front of the bat, the original signal would reach the target, but the echo would not have sufficient energy to return to the bat. The same general situation applies to echolocating porpoises and dolphins, although the distances are greater because of a combination of original signal strength and the sound-conducting properties of water. A false killer whale (Pseudorca crassidens), for example, can detect a 3-in (76-mm) diameter water-filled, aluminum sphere at 377 ft (115 m), a range that is far beyond visual detection. Similarly, an echolo-cating big brown bat would detect a 0.7-in (19-mm) long insect at 16.4 ft (5 m), but see it only at 3.2 ft (1 m). However, because of spreading loss and atmospheric attenuation over longer distances, the same bat would detect a tree-sized object at 49.2 ft (15 m), but would have been able to see it at over 328 ft (100 m). Echolocation is an orientation system that allows animals to detect objects in front of them, and some species also use it to detect, track, and assess prey. The short operational range of echolocation in terrestrial mammals means that it is of much less value in navigation. But short operational range used in combination with local knowledge can be effective in a longer-range orientation. Greater spear-nosed bats deprived of vision and taken 31 mi (50 km) from their home caves could find their way back. Odontocetes use echoloca-tion for navigation in murky, deep, dark waters and a varied underwater topography. 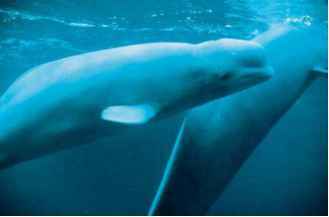 Beluga whales (Delphinapterus leucas) use echolocation to survey the irregular undersurfaces of their ice-covered habitats. Information leakage is an important disadvantage to echolocation. The signals one animal uses in echolocation are available to any other animals capable of hearing them. Many species of insects (e.g., some moths, beetles, mantids, crickets, and lacewings) have ears that allow them to detect the echolocation calls of bats. Moths with bat-detecting ears evade capture in 60% of attacks by echolocating bats, while deaf moths are most often caught. Some herring-like fish change their behavior when they hear the echolocation clicks of dolphins. Weddell seals dramatically reduce their underwater vocalization rate from 75 calls per minute to no calls when they hear sounds from their predators, killer whales (Orcinus orca) and leopard seals (Hydrurga leptonyx). The most obvious eavesdroppers on echolocation calls are members of the same species. Bats often use the echolocation calls of other bats to detect patches of prey or vulnerable prey. Echolocation calls also can serve as communication signals promoting cohesion in groups of flying bats. tion, many social calls are too long to be useful in echoloca-tion. A long signal masks echoes that return as the call is being produced. Some species of mammals make long-distance migrations, typically repeated annual movements between summer and winter ranges. Gray whales (Eschrichtiidae), bowhead whales (Balaena mysticetus), right whales (Eubalaena species), and humpback whales make predictable, long-range migrations between summer feeding areas and winter breeding areas. Manatees (Trichechus manatus) make shorter seasonal migrations up and down the east coast of Florida. Other migrating mammals include some species of bats, caribou (Rangifer tarandus), and antelopes that regularly move between summer and winter ranges. The navigational cues used by migrating mammals appear to vary. Over shorter distances, perhaps first traveled with their mothers or group members, young may learn the landmarks that guide them from one place to another. This appears to be true of manatees off the east coast of Florida. Over longer distances, geomagnetic cues may be more important. However, compared to the situation in migrating birds, relatively little is known about the mechanisms of navigation in mammals.